Although I have tried a lot of recipes from The Cake Bible by Rose Levy Berenbaum, I haven't made much from her Pie and Pastry Bible. I became discouraged with a couple of the crust recipes I tried and just never delved further into the book. Since I had pears that needed to be used, I decided to do a pear tart. My last attempt at a pear tart was a disaster (the filling never set and the crust got quite soggy), so I wanted to try a different recipe. This cookbook came to mind as having a few recipes to choose from, so I starting browsing through it. I was pleasantly surprised - it looks like there are some good recipes in there that I have never tried! The Pear-Almond Tart sounded promising so I settled on that recipe. What I especially liked about the recipe is that it was good for making ahead. Since I had friends coming over to work on our basement remodeling project, I needed something that wouldn't involve a lot of last minute fussing. This could be made in stages, and Rose said the pears, which are peeled, cored and halved, then poached in water, sugar, and Poire William eau-de-vie, would develop more flavor by sitting overnight in the poaching liquid. However, I wasn't about to spend $50 on a bottle of Poire William for the three tablespoons required for this recipe. I've never tasted Poire William so I didn't know what else might be appropriate, but decided to substitute a combination of Cointreau and Lillet because that's what smelled right. I'm sure I looked funny standing in front of the liquor cabinet sniffing bottles of liqueur. My cats were the only witnesses, and since they think humans are strange and inferior anyway I'm sure it didn't faze them. I poached the pears and put them in the fridge. I also made the filling, which consisted of finely ground blanched almonds (I used Bob's Red Mill almond meal to save time and effort), egg, sugar and vanilla. It too went into the fridge overnight. When I made tartlets last week, I made a full batch of tartlet dough but only used half. The other half I chucked into the freezer for later use. 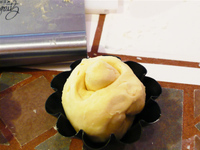 Since I hadn't been thrilled with RLB's crust recipes, I decided to use Flo Braker's beautiful tart dough. It was a little difficult to work for a large tart, so I may have used a bit too much flour when rolling it. I had to piece and patch a little in some spots, but since the filling would cover any boo-boos, I wasn't too worried about it. Rose says that if you thoroughly chill a 9-inch tart shell you don't have to use pie weights. That pleased me since I have issues with pie weights. They mock me by spilling all over the floor, the foil thwarts me by sticking, and in general pie weight usage is accompanied by a lot of bad language. So I put the crust in the freezer for 20 minutes before baking. It worked pretty well - there was a little bit of slumping/shrinking on the edges but overall, it was a success. It didn't puff at all in the middle, and it browned evenly. Score another one for that tartlet dough. That recipe alone was worth the price of the cookbook. Saturday morning I assembled and baked the tart for evening service. The chilled almond filling was a tad stiff and I had to be very careful while spreading it on the crust so I didn't break it. It may have been better to make that right before baking since it isn't difficult or time consuming. It would certainly be much easier to spread. The pears were cut most of the way through and then fanned out just a bit. I know my presentation needs a bit of work but with a square crust I couldn't arrange the pears the way Rose suggested. Part of the poaching liquid is reduced by 2/3 to make a glaze for the finished tart. After the liquid is reduced and cooled slightly, a bit of arrowroot (or cornstarch) is added and it's brought back to a boil to thicken it. Usually I am impatient and don't reduce the liquid enough, but this time I over-reduced not once, but twice! That's OK, it got even more flavorful and I had plenty left. I brushed the glaze over the baked tart and set it aside. While it did get a bit soggy on the second day, that evening the tart was perfect. After a meal of gluttonously thick T-bones served with a mushroom/red wine sauce, sauteed green beans, and baked potatoes, it was bit rich, but everyone somehow managed to clean their plates. I had a very satisfied crew, and my ceiling in the new family room is up! Yay! I know, the saying is "Don't cry over spilled milk," but I didn't spill it, I just let it languish in the fridge. Actually it spoiled before its expiration date, but I didn't want to mess with taking it back to the store. Instead of just throwing it away, however, I decided to find a use for it. I recalled that once upon a time I had a recipe for chocolate cake that used sour milk, so I initiated a recipe hunt. Luckily my first guess was correct: the recipe was in my tattered copy of the Hershey's Chocolate Cookbook, one of the first cookbooks I ever purchased. I've had it since I was a sophomore in college and even though I almost threw it out a few times since I didn't use it very often, nostalgia compelled me to keep it. Several recipes in the cookbook call for either buttermilk or sour milk. In the footnotes of the recipes, the instructions declare that to sour the milk you should add one tablespoon of vinegar to a cup of milk. That is clabbered milk, not sour milk, in my opinion. Then again, one could argue that what I had wasn't sour milk, but soured milk. Semantics aside, I have used soured milk in at least one of these recipes before, so I soldiered on. If you decide to use soured milk for a cake recipe, here's a tip: make sure that it is just a little off. Don't use the stuff that makes the milk jug bulge and has chunks in it. If you have to sniff it to make sure it's bad, then use it. If you retch upon twisting the lid, throw it out. A little tang from the souring is good, but you can have too much of a good thing. Now that you are thoroughly nauseated, let's discuss the recipe. I decided on the "Chocolatetown Special Cake," a strangely-named but, as I recall, good cake. Of course, I also used to like macaroni and cheese from a box - a lot has changed over the years. But while reading through the recipe, I felt that it would be pretty good with a few tweaks. Since I've been honing my baking skills I like to think that I can spot a bad recipe just by reviewing the ingredient list. I can't, but I like to think I can. The recipe uses a technique that Rose Berenbaum and Cook's Illustrated both use to get more chocolate flavor out of cocoa - mix it with boiling water before adding it to the other ingredients. Dairy products can dull the flavor of chocolate but water brings out the full flavor. Hershey's calls for shortening as the fat, which I understand as it will not mute the chocolate flavor the way butter can, but I just can't bring myself to use Crisco anymore. I substituted a combination of butter and vegetable oil, my favorite trick for a moist, even crumb. A word of caution when mixing the cocoa and boiling water to make a paste: even though it looks like a decadent chocolate fudge that you just want to eat with a spoon, don't. I have made the mistake of licking the scraper after adding an unsweetened chocolate mixture to a batter - it is not at all pleasant. Other changes I made to the recipe included adding one egg, cutting back slightly on the sugar, and adding a teaspoon of instant espresso powder to boost the flavor. The batter was very thin, but I was confident it would be fine. Actually I was a bit worried, but it was too late to change anything. I used 8-inch cake pans and I'm glad I did. The layers would have been very thin with 9-inch pans. Also, 8-inch cakes are really easy to work with because you can support the whole thing with your hand, which makes it easier to arrange the layers. The cakes certainly looked and smelled good when I removed them from the oven. They domed a little even though I used cake strips, so I think I should cut back on the leavening a tad. But overall, I was pleased. The crumb was even and pretty fine considering the recipe used unbleached all-purpose flour. The chocolate flavor was quite good, if not outstanding. I used Penzey's natural cocoa. I think I nearly threw out the cookbook before because the recipes weren't that good when I was using Hershey's cocoa, but better cocoa improves the recipes tremendously (sorry, Hershey's). I was torn between two frostings for the cake. Cook's Illustrated's Foolproof Chocolate Frosting was a big hit last time I made it, but the simplicity of Rose Berenbaum's Sour Cream Chocolate Ganache also beckoned to me. I decided on the CI recipe because of the glowing reviews it received from my coworkers, even though it is a bit more work. I think the corn syrup in that recipe is what gives it the luscious, creamy texture that everyone adores. This frosting is also a dream to work with, so I took the opportunity to practice my piping skills. I have been struggling with making a "fleur-de-lis" edge on the top border. I got closer this time, but still need practice. I finished the design with dots piped on the lower edge of the fleurs-de-lis, a shell border on the bottom, and a "spiderweb" on the top. I need to do a demonstration of the spiderweb technique because it it so simple and yet very impressive. I apologize for the blurry photo at top. The decorating took longer than anticipated, so I was running late for work and didn't photograph the finished cake. At work, no one had a camera so I used the one on the MacBook, which isn't the best. But it was better than the one on my cell phone. I think that with a couple more tweaks, this will be an excellent all-purpose chocolate cake. I like it because it doesn't use cake flour (I hate that cake flour is bleached) or any other rare ingredients. Next I will modify the mixing technique and use the hi-ratio method (the one the Rose Berenbaum uses in The Cake Bible.) Once I have the new recipe "perfected," I'll post it on the blog. My goal is to make it as simple as possible so people can use it to replace a boxed mix. It's already better than a mix; now I just have to make it easy. This recipe caught my eye while I was glancing through the cookbook last week. I've been wanting to try out my new Ateco cookie cutter sets so I decided to adapt Flo's tartlet pastry recipe for use in mini-muffin pans. When I say adapt, I mean use exactly as she wrote it but roll it out and cut with a scalloped edge cookie cutter. I want to reiterate my praise for Flo's tart dough recipe. It's not too sticky nor too fragile: I was able to roll out the dough with minimal fuss, and re-rolled it not once, but twice, with no noticeable toughening of the crust. The thing that gives this recipe a whole SOB rating is that there are many steps. 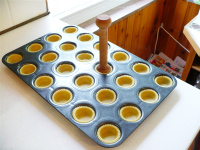 Instead of bothering with miniature tartlet shells, which require pressing balls of dough into the individual pans, I used a scalloped edge cookie cutter to cut out rounds of dough which I then pressed into a miniature muffin pan. Be forewarned: with this recipe it is important to lower the oven temperature if using dark or nonstick pans - mine browned a lot more on the bottom than the top. Next time I may even place my pans on an insulated cookie sheet in addition to lowering the temperature; the difference was that great. The great tool I have for pressing the dough rounds into the mini muffin pan came from the Pampered Chef, but you can also pick one up (reasonably) at Sur la table. Lest Alton Brown berate me for having a "unitasker," I would like to note that this tool is also an effective muddler for making mojitos. I cut the rounds to fit in flush when tamped down, but another interesting effect is to use a cutter with larger scallops and make it big enough so that when you tamp it down, the edges can fold over around the outside of the tart, making a very pretty petal/flower design. The filling for these is a lemon curd buttercream. Sorry, Flo, but since I wasn't impressed with the lemon curd from your Lemon Meringue Tartlets, I used my own TNT curd recipe (shown below). Once it had cooled, I beat in extra butter to taste since I despise a buttercream that tastes greasy. It was fantastic. 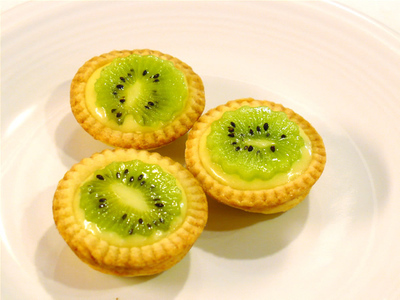 The filling is topped with a slice of kiwi fruit (again, a use for my new cutters!). There is a last step which I skipped partly because I ran out of ingredients and partly because it seemed to be an unnecessary PITA. You are supposed to make a lemon gelee with lemon juice, sugar and gelatin to brush across the top of the kiwi. I guess if you were going to let these sit for some time that would be a nice touch, but it seemed like a lot of extra work. I guess I should make it at least once to see if it's worth the effort - but first I need more lemons. These are very refreshing bites that would be perfect on a hot summer afternoon. Equipment: medium nonreactive saucepan, two medium bowls, fine mesh strainer. 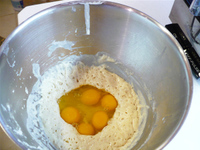 Beat the eggs and yolks with the sugar, lemon zest and salt in a medium bowl until smooth. In a medium saucepan, heat the lemon juice to a bare simmer over medium heat. Slowly pour the hot lemon juice into the egg mixture, stirring constantly. Return the mixture to the saucepan and heat, stirring frequently, until the mixture reaches 170 degrees F (or until it leaves a clear streak on the spoon when swiped). Pour mixture through fine mesh strainer into clean bowl, pressing the top and scraping the bottom of the strainer to get as much liquid through as possible. Stir in vanilla and then butter, 1 piece at a time, until butter is completely melted. Immediately place plastic wrap directly on the surface of the curd and refrigerate until set. If you don't mind a bit of texture in your curd, leave the zest out and add it in with the butter and vanilla. It boosts the flavor to leave the zest in, but I prefer a perfectly smooth texture. I've been meaning to make this recipe from The Bread Baker's Apprentice (Reinhart) for a couple of years but just never quite got around to it. I finally buckled down on Sunday and started early enough to make this in one day. That's the reason I never made it before - if you want to make in one day instead of two, you need to plan ahead, since there are 6 hours of proofing time altogether. 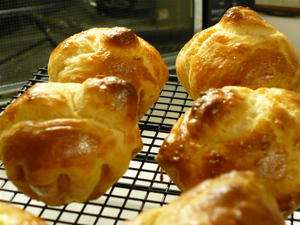 Reinhart gives three brioche recipes in his book: Poor Man's, Middle-Class, and Rich Man's. The biggest difference between them is the amount of butter used. I opted for the middle-class, which is still quite rich at 1 pound of butter for two loaves. I decided to make six petite brioche à tête, the classic shape that I have seen described as having a fluted base and a "jaunty topknot." Then I would make a loaf out of the rest of the dough. The recipe starts out with a yeasty sponge that sits until bubbly. Sponges like this really look like chemistry experiments, which I guess they are. I've never made a yeasted dough this rich before. Since it turned out pretty well it gives me hope that I could make a decent croissant one day. You add a lot of eggs to the sponge, then flour and butter. The dough remains pretty sticky even after several minutes of kneading. I can't imagine how sticky the Rich Man's version would be. Reinhart indicates that it's a little difficult to handle, and I believe it. I scraped the dough out onto a parchment lined sheet pan, sprayed it with cooking spray, covered it with plastic wrap, and refrigerated it until it was quite cold. This takes at least four hours, and I left it to chill for a bit longer than that. Shaping the brioche à tête proved, um, interesting. Reinhart shows two ways and after futzing with the first way for a couple of minutes with no success, I moved on to the second (and probably idiot's) way of doing it. First you roll out a tapered cylinder of dough. You make a hole at the wider end, fold over the smaller end and stick it through the hole. Then you center the "topknot" and put it in the mold to rise. It looks rather odd, like the dough is giving me the finger. If let your imagination wander just a bit other images might arise. Luckily they didn't turn as weird as the shape looked when I was making it. I'm sure this isn't a traditional shaping method, but I doubt no one around here will ever know the difference. I was careful to center the "topknot," but some of them fell over. Even though they may not look perfect, they were rich and delicious. I spread a little homemade jelly on one still warm from the oven. It was buttery goodness. French toast was on the menu for breakfast the next morning, served with homemade bacon. It really doesn't get much better than that. Flo touts these as a coconut cookie "that melts in your mouth." And that is the exact phrase my co-worker used when munching on them yesterday. They are quite easy to make and utterly delicious. The only caveat about these cookies is that they call for medium shred unsweetened coconut. That ingredient might be difficult to find for some people, especially those not in an urban area. I find unsweetened, medium-shred coconut at my local health foods store. You may also want to look in the organic section of your grocery store as most organic coconut I have seen is shredded as opposed to flake. How much of a difference does shredded vs. flake coconut make? I don't think you would achieve anything close to a "melt in your mouth" texture with large shredded coconut, the variety you are most likely to find in the grocery store. The photo at right depicts the difference. Each of those mounds is about the size of a quarter. I suppose you could use a food processor to take regular unsweetened flake coconut and make the shreds smaller. I've not tried it but I do think it could work. 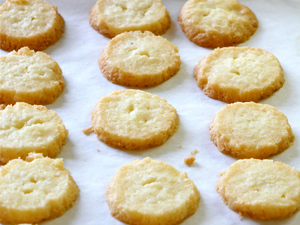 This is a basic shortbread cookie recipe with the addition of one yolk. The dough is a bit on the sticky side, but Flo has you roll it out in more coconut which makes it pretty easy. Since these are miniature cookies, the logs were only 1 inch in diameter and 9 inches long (the recipe makes 8 logs). It took a bit of time to cut them into the teensy-weensy cookies you see at top. If you wanted larger cookies I see no reason why you couldn't make the logs bigger. I think these will be on repeat rotation, and probably on the holiday cookie tray (as larger cookies). Oh, I did make one change. Again, the recipe called for no spice or vanilla. I added a squirt of vanilla to the recipe because I think it enhances the flavor. I suspect a touch of nutmeg or a grating of lime zest wouldn't be bad either. As the old saying goes, "everything old is new again." I've been seeing a lot of retro recipes out there lately. Most of them are as icky as they were 20, 30 or 40 years ago. Seeing a rash of retro recipes got me to reminisce about my high school home economics class. I won't tell you how long ago it's been, but since it was actually called home economics I'll bet you have an idea. I remember the sewing part, which I didn't like very much, where we made aprons, potholders and a couple of shirts. I was more interested in the cooking part. We made cakes, cookies, and other easy stuff you could make in 40 minutes with little equipment. One of my favorite recipes was for Parmesan potatoes. These were an easy side dish that I made frequently after learning the recipe. It was red potatoes sliced thick (about 1/3 inch), dipped in egg, and coated with a Parmesan/bread crumb coating, then baked. I still had the recipe although I hadn't made it since college. But since I had such a positive memory of the dish, I decided it was worth an attempt to see if my memory was true. Of course I made a change right off the bat - I long ago banned the green can of Kraft Parmesan "cheese" from our house, so we had to "settle" for real Parmesan-Reggiano. The spices were simple, just salt, pepper and paprika. I sliced the potatoes a little more thinly so they would cook in a reasonable time. I hate undercooked potatoes. The potatoes were served with French onion soup - a weird combination, but I just wanted to try the recipe, so if they didn't work out it would be no big deal. The French onion soup was delicious since I made homemade beef broth for it. I really should have photographed the broth-making process since it turned out so well. The broth was full of body and even without reducing it set up like Jello in the fridge. I had to thin it a bit so the soup wasn't too thick. I made the broth in the oven which worked very well. After letting the potatoes bake for about 40 minutes, I pulled them from the oven and tested one. It wasn't half bad. I wasn't as wowed with them as I was as a 17-year-old accustomed to underseasoned food and meals from a box, but they were good. They could have used more Parmesan cheese so the outsides would be more crisp. Actually, pan frying these would probably be really good, but of course more fat and calories (I say that like it's a bad thing). But even just baked on parchment they had a little crunch and decent flavor. I probably won't make them again for another few years, but it was a nice trip down memory lane. First things first - it's sherBET, not sherBERT. I know, it's pronounced SHUR-bit, but I wanted to emphasize bet vs. bert. I wonder where that extra R originated? It's a little like some pockets of the country where clothing gets "warshed." That R sure is a pushy little letter. Okay, okay, I'll lay off the grammar and spelling. Homemade orange sherbet is to the garishly colored, artificially flavored supermarket stuff like, well, like anything homemade compares to mass-produced industrial slop. The flavor is more subtle yet somehow livelier, the color creamy and natural, and the texture sublimely smooth, even though there aren't any gums or conditioners. Sherbet has the added advantage of being absurdly easy, as long as you have an ice cream machine. 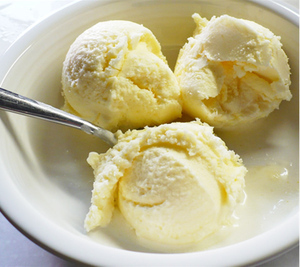 You could, I suppose, make it like a granita, pouring the mixture into a pan and stirring it several times as it freezes, but an ice cream machine produces a superior texture. The ingredients for orange sherbet are basic: orange juice, orange zest, sugar, lemon juice, cream and a dash of alcohol to keep the texture from becoming icy. Alcohol abstainers, feel free to omit as long as you are aware that the texture will suffer. The recipe I followed was, naturally, from Cook's Illustrated. After zesting the only orange soft enough to zest (I'm ashamed to admit the oranges were months old), I juiced it and the rest of the remaining oranges along with one lemon. I initially misread the recipe and thought it called for 2 tablespoons of liqueur instead of 2 teaspoons, so I poured 3 tablespoons for good measure. I then reread the recipe and noticed my error. But after mulling it over for about a millisecond, I poured all the Cointreau into the mixture. After all, my motto is "the more liquor, the better." Well, up to a point - I learned that painful lesson years ago. The zest was added to the sugar and a pinch of salt in the food processor and whirled together until the zest was fully incorporated. 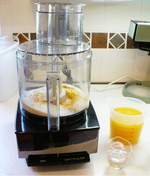 The juices and liqueur were added in a slow, steady stream to the sugar mixture until the sugar dissolved. I whipped the chilled cream to soft peaks and whisked in the juice mixture, then poured the whole shebang into the ice cream machine. I couldn't help but sneak a taste after 20 minutes of churning, and was rewarded with a luscious spoonful of delicate orange flavor. After about 30 minutes of churning I poured the sherbet into a container for hardening. You can see the lovely result at the top. Yum. I'll be making this again, next time perhaps infusing the cream with additional flavors. I'm thinking lime-mint for the next batch. Ooh, maybe coconut-lime-mint. I better do some more yard work so I can burn off these calories! I won't repeat the rest of the rhyme but I'll bet you can finish it. 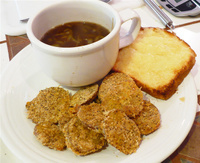 Beans and cornbread (or alternately beans and 'taters) is the state meal of West Virginia. "Beans" in this instance means pinto beans exclusively. 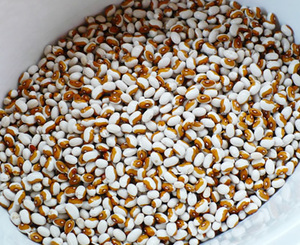 I confess, until I moved here I had never eaten a "brown bean" as they are also known. Even during my three years as a vegetarian, when I consumed a multitude of bean concoctions, I didn't have pinto beans. Since I became a resident of the great Mountain State (no snickers from those living in Colorado, please), I've had pinto beans regularly. They are an easy, nutritious (if you don't put a ton of fatty meat in the pot) and delicious (if you do put a ton of fatty meat in the pot) meal. I usually make them in a crockpot so we can enjoy them on a weeknight. Astute readers will notice that the photo above left does not depict pinto beans. Those, in fact, are yellow eye beans, a variety I spotted recently at the Farmer's Market. I thought they would be a nice change of pace from the standard brown beans. I first saw yellow eye beans on the Rancho Gordo website. Rancho Gordo has unique, fresh, high-quality heirloom beans and other tasty foods, all at a price I just can't justify. If I ever win the lottery I will buy several pounds of Rancho Gordo beans and see if they are indeed worth $5/lb plus shipping. I've heard really good things about the quality of Rancho Gordo products but can't see spending 10% of my weekly food budget for one pound of beans. In my opinion, all great beans have a pork product as their soul mate. 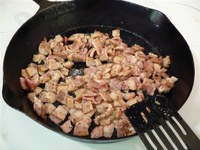 I chose to pair peppered bacon with the yellow eyes, so I fried up diced bacon to render out some of the fat. I then softened chopped onion in the bacon fat, and added two large cloves of minced garlic. Since I'm a fan of carbonara, so I decided to deglaze the skillet with white wine (in this case, vermouth so I didn't have to crack open a new bottle). Just after I poured the vermouth into the pan, I panicked. Wine is an acidic ingredient, and if there is one no-no when making beans, it's adding an acid before the beans are fully cooked, lest the beans refuse to become tender. But I was committed at that point, so I let vermouth cook down until syrupy, hoping that would neutralize some of the acid. (Maybe I should put a Pepcid in the pot?) A generous amount of kosher salt went into the crockpot along with the bacon mixture, beans and water. After adding black pepper I set the crockpot on high and crossed my fingers hoping for a positive outcome. Many myths abound about ingredients that will a) keep beans from becoming tender or b) counteract the "windy" effect beans have on some people. Acid seems to be an ingredient that might keep the beans from cooking properly. Salt is essential to flavor the beans and has no effect on whether they soften. The biggest problem I have found with tough beans is that they are too old. It's hard to tell just how long the beans have been sitting on your supermarket shelf, or if they have been stored properly. Baking soda and a few herbs like epazote are supposed to keep the flatulence down to a minimum. I've not noticed any difference in the "outcome" by adding any ingredients or by pre-soaking the beans. Usually beans don't have a deleterious effect on my digestive system, but just in case I try to eat beans when I don't have any social situation planned for later in the day. After three hours of cooking, I noticed the beans boiling a bit too rapidly so I turned the crockpot to low. I tested one of the beans and it was still crunchy but had softened up somewhat. I hoped for the best and replaced the lid. 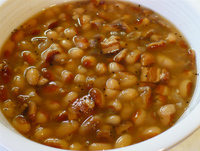 On eGullet, Russ Parsons posted a thread about cooking beans in an oven for just 1 1/2 hours, with no presoaking, and achieving tender, fully cooked beans. I think he's full of beans. He must have access to fresher product than I do, because I've never achieved that result in so little time. Have any of you ever cooked beans in just an hour and a half? These beans may have taken more than an hour and a half, but the results were delicious. This may have been the best pot of beans I've ever made. They were tender but not mushy, and the flavor was exceptional. No one ingredient overpowered the rest, but instead combined into a glorious whole. With a shot of Crystal hot sauce, they were exquisite. I'm off to the Market to get more of these pretty and tasty beans.